Technology is evolving at an extremely fast pace, there’s no doubt about it. With this new modern technology comes bigger and more advanced items at our disposal, and that’s where portable camping fire pits come into play. When I first started camping there was no such thing as portable fire pits unless you made one yourself, and even then they were subpar. Nowadays there are portable fire pits we can take with us literally anywhere, and I’ve found the top 9 on the market and put them in this article. Here are the top 9 best portable camping fire pits for you to enjoy. What is a Portable Camping Fire Pit? 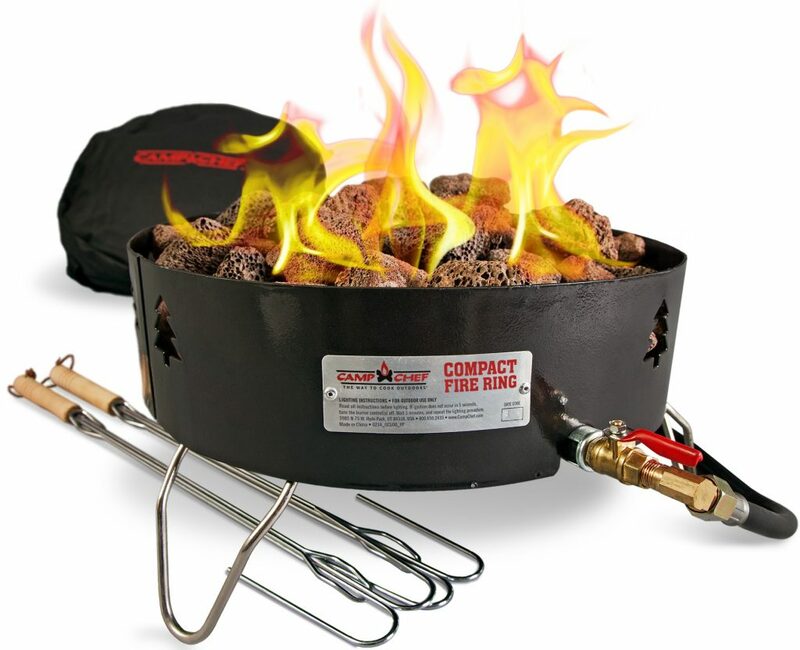 A portable camping fire pit is a pit made out of stainless steel or other similar material to hold wood for burning, creating a campfire that can be taken literally anywhere. Some require propane gas to function and some require just your average wood, but under each fire pit I’ve written down the fuel requirement so you already know before purchasing. Portable fire pits take the hassle out of cleaning up a giant mess since it’s all contained in one little pit. And if you go with a propane pit, there is no mess to clean at all since it instantly turns on, and can be used in a fire ban restriction area. As more and more forest fires are happening, more campsites are prohibiting the use of campfires during the summer months, and that has become a big problem for outdoorsman like you and I. One way to avoid this and prevent it from ruining your camping trip is by using a portable fire pit powered by PROPANE gas. As you read through these fire pits you will see what the type of fuel they use. The ones that use propane as fuel are the ones you can use during a fire restriction area, which is something you should REALLY consider since many campgrounds are doing it these days. Most lava rocks need to be cured before being used, and that is what a lot of people fail to realize. One simple way to do this is by putting them into your fire pit and cranking it up to high for 10 minutes, which will “bake” the rocks and make them last a lifetime. However, be sure to keep your distance while this is happening as the lava rocks may or may not pop and crack. After 10 minutes, the setup is complete and they are ready to use. The Sunward Patio as the name suggests, is not JUST good for patios, as it’s lightweight, compact and portable so it can be taken anywhere and that is what the manufacturers recommend as well. It has great heat distribution and it’s smokeless, which is ideal for cooking meals. The gas consumption is good and burns a 5 gallon propane tank over 24 hours. The base has been heightened to allow for placement on heat sensitive areas, such as: patios, decks, etc. It is a durable stainless steel material that is made for high quality and longevity, and yes it can also be used in a fire ban area. Other campfire imitations rust easily, however, the Sunward Patios high quality steel fights corrosion and rust so you can be sure your product will last a long time of frequent use. It is fully certified with CSA compliance, which means it’s been tested and found to be safe to use every time. The included 10 foot gas line allows the tank to be moved far away from the campfire to avoid explosion. This is so easy to take on your adventures thanks to the carry handle and storage bag. One of the few portable fire pits that actually holds a solid 5-star rating is the Solo Stove Bonfire Fire Pit. The design is patented and truly one-of-a-kind, as it’s classed as the most beautiful single unit fire pit ever created. It has less smoke than other pits so clothes won’t smell and takes on a modernized appearance. Manufacturers claim it as the most unique fire pit in the world as they focus on a minimalist design while pushing the limits of combustion air flow efficiency. The double wall design maximizes air flow and burning process while the bottom holes feed the fire with oxygen. This fire pit fully burns logs completely so smoke is kept to a minimum; you won’t be trying to dodge smoke while sitting around the campfire and you’ll use less wood than an open fire (thus saving you money in the long run). This also means cleanup is a breeze and not as messy. 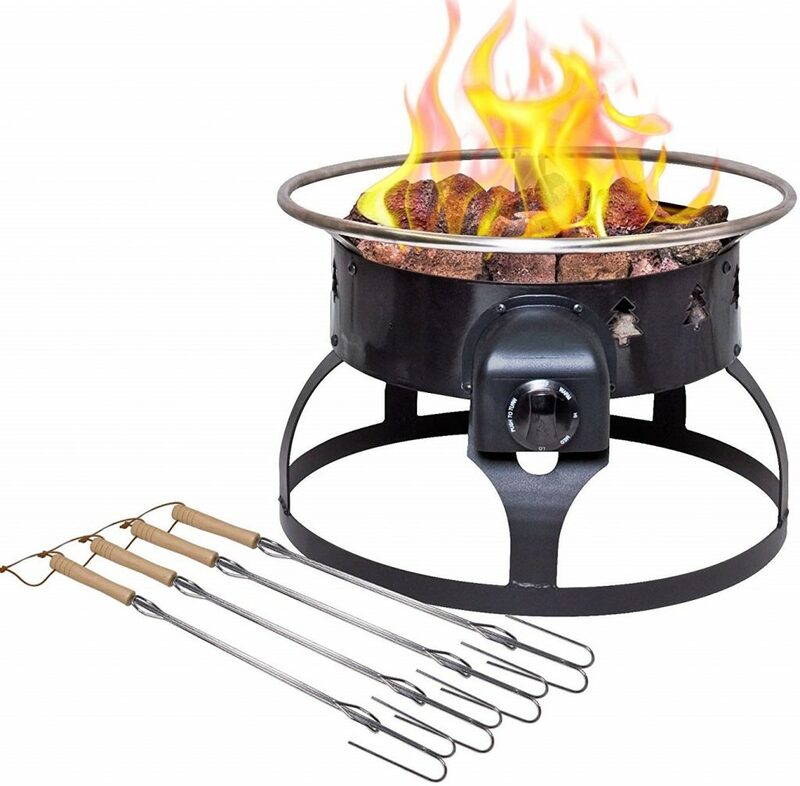 The Solo Stove Bonfire Fire Pit is fully portable, requires no additional parts and stays ready-to-go every time since there is no setup required. A heavy duty carry case is included in the purchase. The Double Flame Patio Fire Pit also holds a 5-star rating. It has won an award for being the “Best In Show” by Hearth and Home Magazine. Heat rises from the bottom and get released through the holes along the rim. At the same time this is happening, smoke is being burnt off at the top layer so virtually little to none makes its way out. It is highly portable weighing at only 42 lbs, making it a great choice for camping. 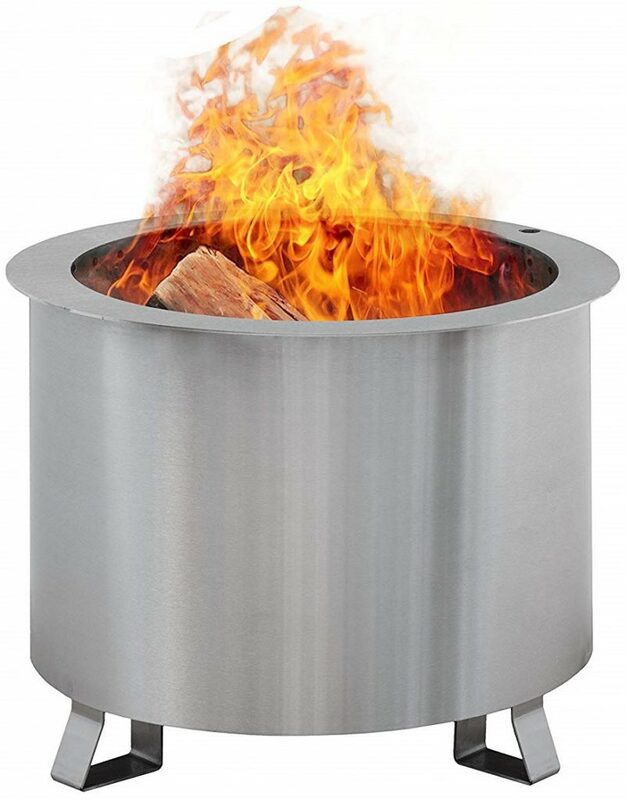 The thick, heavy duty stainless steel creates a strong fire pit capable of withstanding 15 years of use and easily fights corrosion and rust. It has an optional grilling feature (patented double combustion system), which lets you cook all your favorite foods but without tasting smoke and soot while enhancing the flavor. The grilling feature is NOT included in the purchase and has a heat-resistant handle for easy handling. The Camp Chef is highly convenient and portable. It comes with a base and high-pressure burner, which is fueled via propane gas. It’s simple to use since there’s no gathering wood and trying to get it going, it’s just a matter of plugging in the gas bottle and turning it on. It is smokeless and can be used in a fire ban area, however, be sure to check with the local ranger first. The decorative cutouts add a modern feel without sacrificing the “real” outdoor ambiance feeling. It features a built-in output burner, setting feet to prevent overheating of the ground beneath and lava rocks which helps disperse the flame for a consistent heat throughout. 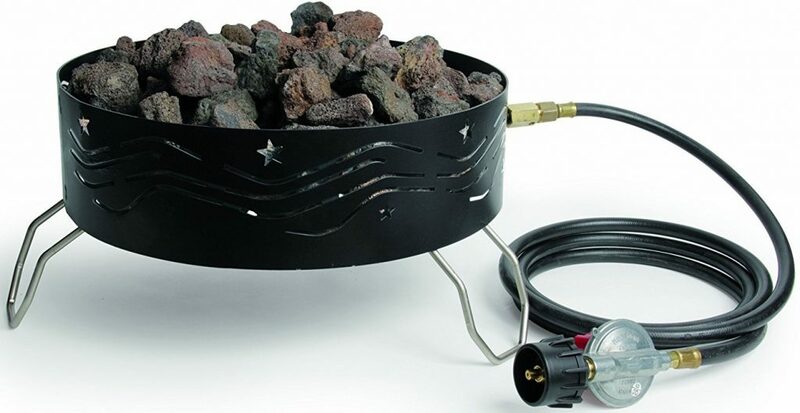 Included in the purchase are 12 pounds of lava rocks, a regulator, a carry bag, 5 feet hose and 2 extendable roasting sticks so the kids can roast marshmallows! Simply adjust the flame with the fully adjustable heat-control knob to your hearts desire. It’s an absolute beast in terms of heat dispersion and flame height and surpasses its competitors in this field. The Outland Firebowl is a great alternative to a traditional campfire considering it’s affordable price range and the many features it provides. It’s one of the few fire pits you can use during a campfire ban. It features high quality steel that is coated in protective powder and an enamel finish for increased durability and longevity. The auto-ignition feature makes it easy to ignite and the rubber comfort-grip ensures easy usability when lighting and increasing flame height. It is ergonomically designed for a contemporary appearance with a stainless steel belt, fasteners, burner and chrome knob. There is a pre-attached hose w/regulator, propane stabilizer ring and decorative rocks to add character. It is lightweight, portable and includes a cover and carry kit to keep it safe on your travels. It is also CSA approved, meaning the design and manufacturers standards have all been certified for safety. It requires a 20 lb propane tank to fuel but is not included. There is no smoke and it always burns clean. Sunnydaze are well known for releasing high quality products, and this one is no different. 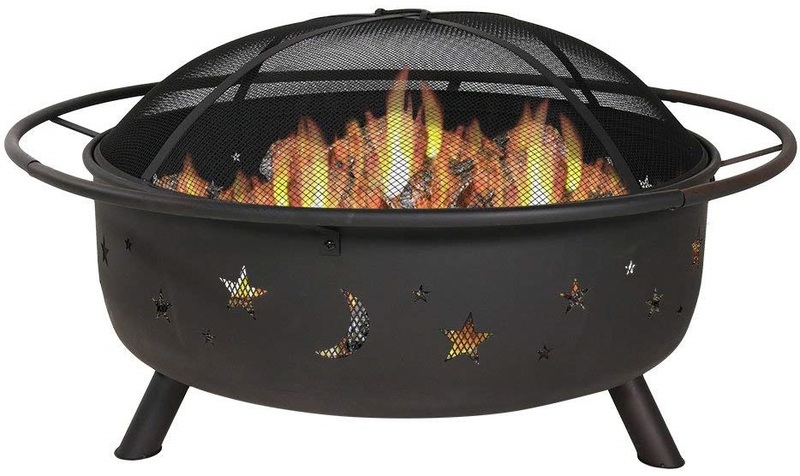 The Sunndydaze Fire Pit features a contemporary design with decorative stars and moon cutouts to add to the outdoor feeling while being able to see the wood burning. It has a solid steel construction and rustic patina colored high temperature paint for amazing heat resistance, durability and longevity. All of these put together create a highly unique, versatile and artistic charm. It has high fire safety thanks to the spark screen which is not found on many other fire pits. 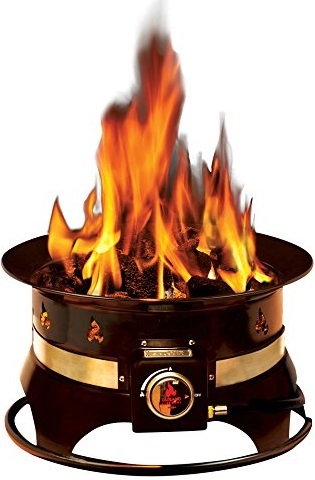 The outer ring holds in wood that may fall and the poker/lifting tool allows easy moving of the firewood and spark protector without burning yourself. The Sunnydaze Fire Pit is really wide so you can pile on the wood and get a good blaze going, warming everyone up around the campfire. It’s easy to maneuver when ablaze thanks to the outer rim and even comes with a 1-year manufacturers warranty. 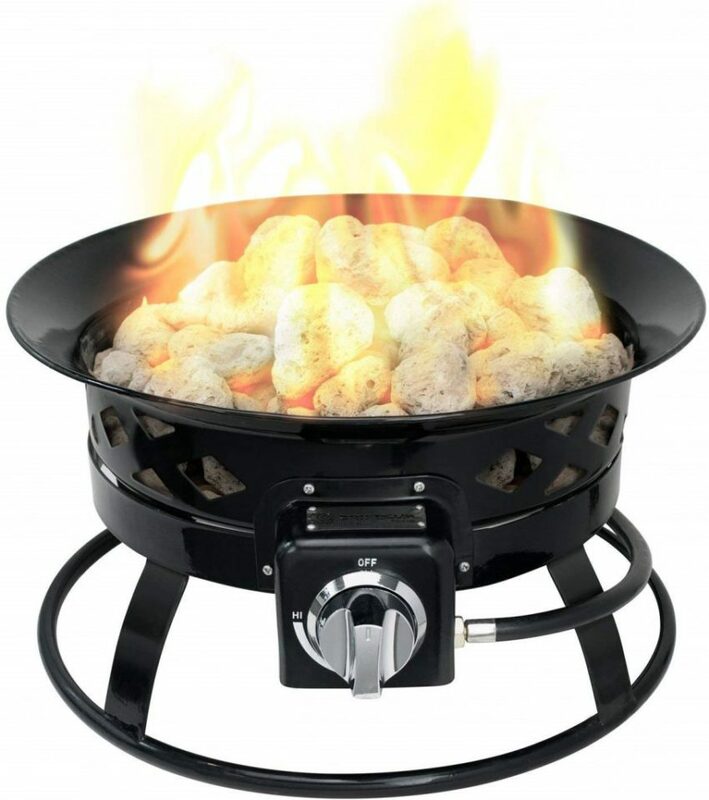 The Camco Portable Propane Campfire has natural lava rocks to radiate heat and keep a high temperature and makes a great choice for camping where a fire restriction is in place. It uses propane gas as fuel so the more expensive firewood fuel (if you purchase campground wood) is not needed and you’ll actually save lots of money in the long run. It has absolutely no smoke, no ash and no mess to clean, making it super easy to setup, to store and to use and no worries that you’ll smell like a campfire when you go to bed. It features folding legs so you can sit it literally anywhere without fear of falling over or burning whatever it sits on. The decorative cut outs enhance appearance. An 8 foot hose, adjustable regulator, 2 bags of lava rocks and carry bag are all included in the purchase. The adjustable regulator allows you to choose the flame height and size of the fire and it actually has an even distribution of flame throughout the tray to make cooking a breeze. Materials: Heavy gauge steel, nickel coated steel safety rings. The Campfire Chef Redwood has a flame-control dial so you can keep extra warm when sitting around the campfire, otherwise tone it down when toasting marshmallows! There are 4 marshmallow roasting sticks available in the purchase. It has pine cone cut outs to give you that outdoor feeling, and since it uses propane gas it can be used in most fire restriction areas. It features a matchless auto-ignition in the event you lose your lighting sources or can’t find them quickly. It sits on a safety base that can be placed virtually anywhere. There’s no need to worry whether or not it’ll burn the ground or surrounding items. Also included in the purchase is a carry bag, 12 lbs of lava rock, regulator, 5 feet hose and propane support tank. 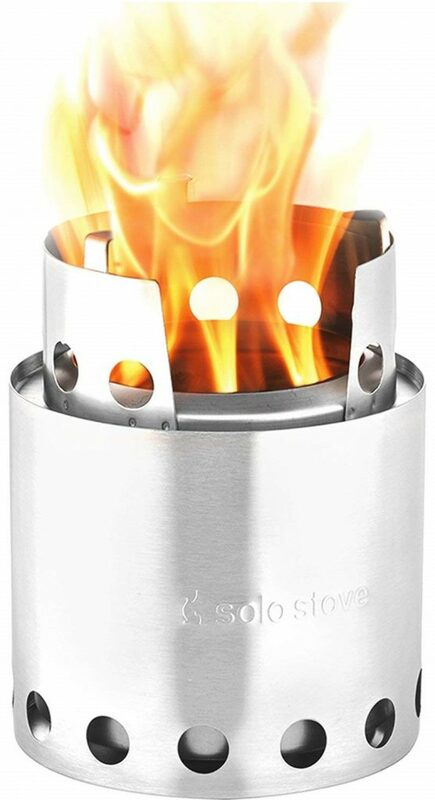 The Solo Stove Lite has received many purchases throughout the years. A good reason is that it’s fully portable for lightweight campers. It is by no means a large fire pit to keep a family warm on a cold night, however, I listed it for many other reasons and you’ll find out why in just a second. It’s a GEAR OF THE YEAR WINNER as it’s recommended by “Backpacker Magazine” and many other serious survivalists! The patented, “less smoke” design is what this portable pit possesses even though it’s small in size and burns fuel to complete ash (much easier to clean up). Since it’s so small it requires only small bits to fuel – twigs, leaves, pine cones and natural biomass is all you need to get this little bad boy up and running! That means fuel is free and accessible literally anywhere you go. It is extremely lightweight (9 ounces) since it’s designed for backpacking and surviving and is quick to boil water, which is done in 8-10 minutes! 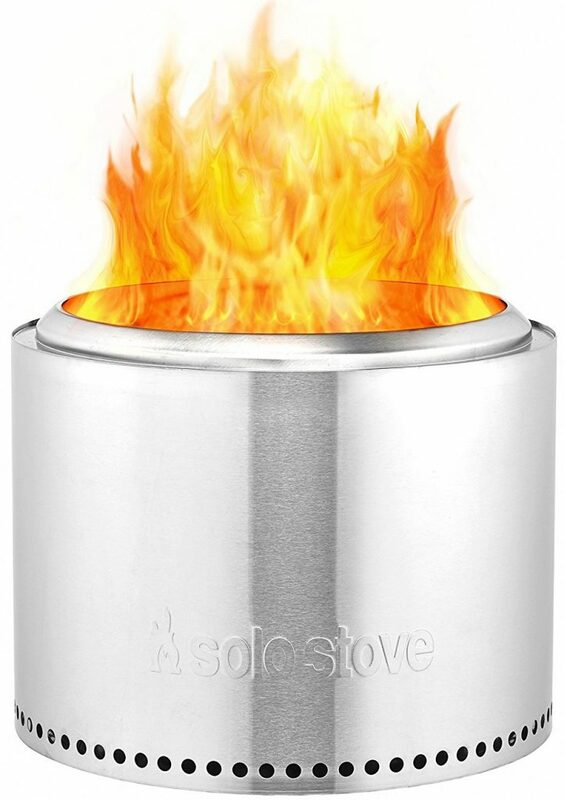 The Solo Stove Lite has a Pot which is designed specifically for this product (sold separately) and great for cooking meals or boiling water. The best portable camping fire pit goes to the Sunward Patio Portable Pit. It is the safest choice above all else as the heightened base prevents overheating on whatever it sits on. It’s amazing on gas consumption and packs a punch in terms of flame height/heat distribution. However, for the more traditional campfire feeling you can’t go wrong with the Double Flame Patio Fire Pit. 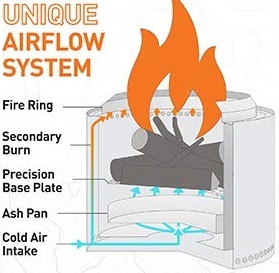 It uses wood as fuel but due to new science findings, it is smokeless and burns wood to complete ash so you use less wood and save money on expensive campground firewood. It is one of the higher quality ones that use wood as fuel and an absolute beast in terms of corrosion-resistance and longevity! Well that concludes this article and thanks for reading! Wow! What a great read. Having so many forest fires around our home this summer really sheds a light on the fact that there are different options for a good ol’ camp fire. I had no idea that there were propane options, but this has definitely peaked my interest. This may just be a must have for next summers camping trips! Propane options are new to the outdoor world and becoming increasingly popular year after year. New technology is going to bring even cheaper options that are higher quality and durable. Get ahead of the game while it’s still early! Wow. Great run down of some high quality fire pits you can buy. I checked one and they are affordable and I like the info you provided on how to keep a safe fire pit. The videos are very informative as well. Great post here. Most of these are very affordable considering how much joy you’ll get out of them, and that’s why they are so popular not just for camping but anything to do with the outdoors. Thanks for all the helpful information on these fire pit options. This has made it much easier to determine which one is right for each person’s specific needs. I especially appreciate the information above about the restrictions and the use of propane fire pits…I had no idea. Keep up posting the great, helpful information! I also love the fact that the propane pits can be used during a campfire restriction. Although nothing can beat traditional campfires, these will stop fire bans from ruining your trip since you’ll have that “outdoor feeling” while you’re out with family and friends. Brandon, I wish we had these in my British Columbia camping days! Great detail on the performance and utility of these units. Just reading through this is enough to make an informed decision, no need to click away and look elsewhere. Nice touch with your recommendation on your personal favorite 2 pits at the bottom of the post. I hope you find something you like for your next camping trip! I just went through your article because I needed a good firepit to use mostly on camping, and the variety of good choices in here left me thinking and not an easy to make a decision at all. I love them all. However, I think I will go for Solo Stove as it is more familiar to me than the others and I am just going to stick with it. Thank you for this article. Very helpful. That’s one of the fire pits I recommend at the bottom of my article. It is a great choice and you can’t go wrong if you’re after the traditional camping feeling but without smelling like a campfire or spending a lot of money on wood (wood burns complete so you use less of it). Great article. Who knew there was so much to know about campfires. Thanks for all the information. I think these portable campfires are excellent. Thank you Melanie. These are the best ones I could find with the best reviews and low negative feedback. Wow, Brandon, I had no idea portable camping fire pits existed this has been a complete brain twist (for the better) for me. Love your tip, sounds like essential one, to remember to cure your lava rocks ahead of time – thanks – such a simple thing to do but sounds like fatal if you don’t do it. Thanks for sharing! It’s a great idea to cure your lava rocks beforehand so you don’t end up curing them when the kids are around the campfire and end up putting them in danger. Glad you learnt a thing or 2! Great post. I love camping. Never had a portable pit though. Makes sense with the reviews you gave. Thanks for the info. Cheers for the comment Koby. Wishing you all the best on your next camping trip. Nice to see a review with all pros and cons! It was a long time since a used a camping fire pit, I think it was when I was camping with some friends for about 15 years ago. Now that my kids are growing up I would like to let them feel how it’s like to camp. I would definitely need a fire pit for those moments and these reviews got me thinking in the right direction. Thanks for an unbiased review! That’s a long time ago, and I bet they’ve changed drastically since then. I agree that you should take your kids on a camping trip, they will love it! I had no idea there were so many choices out there. I really love the number of options you provide and that you picked a winner. I see so many reviews where there is no conclusion! Great job – this will be my resource when I am in the market for a fire pit. Hi Brandon, I really am amazed at the selection of fire pits available! Never knew there were so many options! I just love the look of the Sunnydaze. Really great informative article, thanks for sharing. That’s an awesome fire pit Mariette. All the best on your ventures. 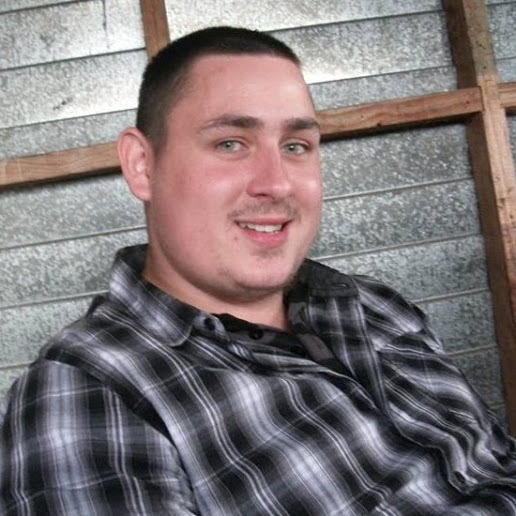 ok that was awesome Brandon i see you listed every details on here this is very good information, thanks for sharing.